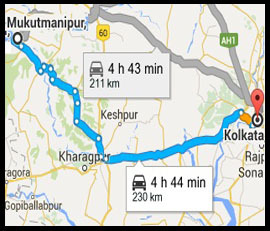 Mukutmonipur and Jhilimili nearby are major tourist attractions visited by more than a lakh (100 000) visitors. 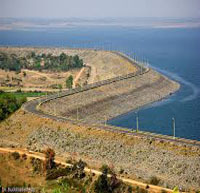 The second biggest earth dam of India is located in Mukutmonipur 55 km away from Bankura. According to one description, “green forests surround the vast bluish tract of water, and the hillocks are picturesque. The place is very famous for its superb natural beauty. The undulating terrain along the southern edge of the Kangsabati water reservoir spreads as a three-dimensional necklace in green and terracotta.” The SDO, Khatra, Mr Sanjay Vansal said: “We have got a Rs 80 lakh composite UNDP project for Mukutmonipur. The project has been conceived to promote tourism and improve the condition of the tribal artisans devoted to the craft work with bamboo sticks and saboi grass.”  Approximately two kilometers from the lake is the Bangopalpur Reserve Forest, a home of many species of flora and fauna. Four kilometres from the dam is the ancient town of Ambikanagar, once an important place of pilgrimage for Jains. However, a flood destroyed most of what remained in 1898.